From 18-22 September, our “Futures of Syria” Conference took place. We thank the International Institute for Social Studies for opening their doors to us. We have been working on scenario building under the supervision of the Clingendael Institute. 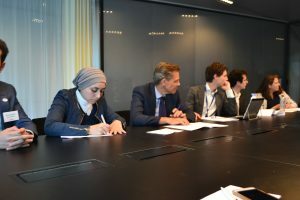 Through fruitful discussions, our participants managed to establish profound scenarios for the future of Syria at the end of the week, which they presented to the Ministry of Foreign Affairs on Friday. Based on these scenarios the delegates were able to set up action plans to get involved in the peace process in Syria. Are you interested in the focus of the action plans the delegates came up with? Read the conclusion of the conference here: YPI Futures of Syria – Conference 2017! Since early 2011, widespread war crimes and crimes against humanity committed during the war in Syria have displaced almost half of the Syrian population. The war is entering its 6th year and there seems little prospect of peace. None of the belligerents have the upper hand, although all have secured international backing, adding to the complexity of the conflict. Meanwhile, young Syrian status holders in the Netherlands are rebuilding their lives and preparing for a future for themselves and their families. Where these futures lie, is closely intertwined with the developments in their home country. Yet, with the situation on the ground in Syria changing every day, the future of Syria and the possibility of return at some point are highly uncertain. Since peace talks have not reached any agreement, a group of young Syrians have decided they will not wait for it to prepare for peace and be part of the process. It is time for the youth to take the baton, to unite and think about their country’s and their own futures. 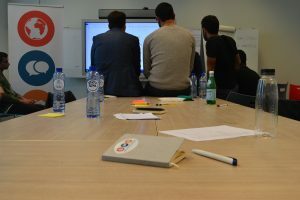 In support of this, a Youth Peace Initiative (YPI) for Syria has been set up to enable young Syrians in the Netherlands to put their heads together and have their voices heard. On 24 April 2017, YPI welcomed its brand new Syria Delegation at the first event for these young Syrians in the Netherlands. Read about the day in our report here!